Rotherham United go into tomorrow’s game with top club Wigan Athletic on sixty-nine points with the Millers Assistant Manager Richie Barker telling Radio Sheffield that he believes two more wins should cement their place in the play-offs. 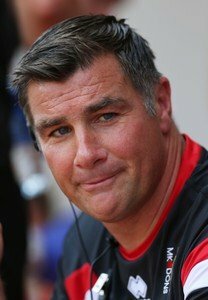 ‘I think if you look over the last ten years I’d be amazed if anybody hasn’t made it in with seventy-five points,’ Richie said. ‘If you look at a win and a draw then you might be relying on other people and just one win you will definitely be relying on other people. ‘And we don’t want to be going into the last couple of games relying on others although if you look at the fixtures there is some strange quirk of events going on there. From us, in fourth, down to about eighth place it’s like a mini-league where almost everyone plays everybody. There will be some twists and turns but I think two wins would probably do it although one wouldn’t be a million miles away. ‘This division is getting stronger and harder every year. I’ve probably been in the league for seven or eight years and I’ve seen the improvements probably due to the fact that the teams coming out of the Championship have better resources, better finances and are keeping their players.